We’re told it’s the wave of the future. Design, make, enjoy. Beyond home-based 3-D printers, there will be new machines and display screens and apps that will invite you to have day to day products just the way you want them. Digital buffets await and not surprisingly the time is now to contemplate robot bartender systems. Such a system is on display now, which can serve the cocktail of your latest twist of imagination. Makr Shakr is the name of the new system which goes on display at the Google I/O conference in San Francisco, starting Wednesday. The drink-making robotic system made its debut during Milan Design Week 2013, and is making a debut in its final configuration at the Google event. 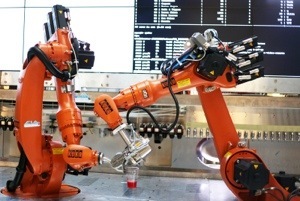 The system can make the cocktail you want with its three robotic arms, which mimic the actions of a bartender. Shaking a Martini and slicing lemon garnishes are part of its repertoire. A smartphone app allows users create their cocktail concoctions from scratch. This entry was posted in Art (maybe), Technology and tagged bartender, Make, Makr Shakr, MIT by Sci Fi Engineer. Bookmark the permalink.